Where there are two or three small people m the house, it is rare indeed for many months to pass without the occurrence of some minor accidents in the nursery. The child just beginning to toddle miraculously escapes a good many tumbles, it is true, but sustains not a few bruises now and again by coming in contact with chairs or tables or bumping its head upon the floor. Wherever there are small boys, tree climbing or rough and ready games make the occurrence of cuts, strains, even sprains, very likely. Whilst poisoning is very rare in the nursery where people are careful about reading labels and keeping all poisonous drugs out of reach, children are sometimes poisoned by sucking coloured toys or lucifer matches. Mothers, also, should be alive to the fact that chronic arsenic poisoning will occur if the nursery wallpaper contains arsenic. Bites, or scratches, again, happen frequently when dogs and cats come in contact with the children, whilst certain young people have a perfect genius for swallowing things. Whilst the articles on first aid which have already appeared in this section (see Index of Vols. I and 2) apply to children as well as grown-up people, a few special points may be mentioned about accidents which are particularly likely to occur in the nursery. A bruise is a swelling caused by external violence, such as happens when a child strikes any part of its body against a hard surface. A painful swelling very quickly appears, which is blue at first, owing to the effusion of blood. Then it turns green, and then yellow, and finally disappears. It is important to arrest bleeding which occurs underneath the skin as quickly as possible, in order to prevent the swelling increasing in size. This should be done by the application of cold and pressure, and the keeping of the injured part at rest. Eau-de-cologne may be applied to the bruises if the skin is not broken, or cold water dressings in the shape of pieces of linen or handkerchiefs wrung out of cold water, kept in place with a firm bandage. Later, if there is much pain, hot fomentations should be used, in order to soften the tissues and relieve tension. A little grease, such as boracic ointment or zinc ointment, can be applied with advantage from the beginning. 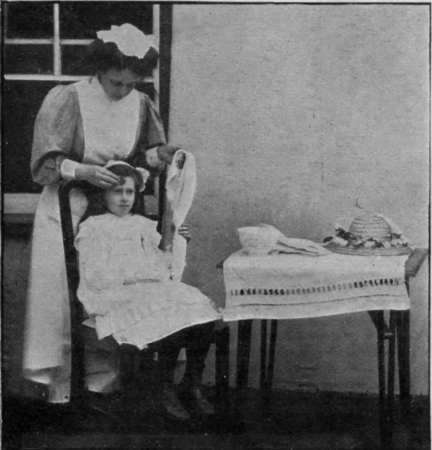 When bruises occur in the nursery, perhaps the commonest situation is the scalp, and mothers are often terribly alarmed by the sudden and great size of the swelling which appears on the head. One of the best ways of treating this is to wrap a coin in a handkerchief and bind it firmly over,the injury. If this is done at once, it will often prevent any swelling appearing at all. A black eye is another common bruise which follows a blow upon the eye. The tissues of the eyelid are very loose, and swelling will occur very rapidly and markedly by the blood escaping into the tissue. The best treatment is to bathe the eye quickly with cold water, then put a folded cloth soaked in cold water over the eye, and bandage in place. When the discoloration is very bad, the eye should be bathed with a weak lotion, such as arnica, which can be obtained from any chemist. Another nursery bruise which is very painful, and not at all uncommon, is produced by shutting a door or drawer upon the finger. As a rule, the nail gets black very quickly from the blood which is effused underneath it. For this injury quickly wrap a cold water bandage, or cloth wrung out of cold water, round the injured part, and keep it at rest in order to lessen the amount of blood passing to the part. After an hour or two, if the finger is very painful, it may be placed in a basin of water as hot as can be borne. This hot water treatment softens the nail, and reduces the pain in consequence, because the blood does not press so hardly against the unyielding nail. A doctor should always be called in for such an accident, as suppuration may occur afterwards, and the nail nearly always comes off. Sprains and strains may occur from rough play, or from carelessly lifting a child up by the arm, for example, thus injuring the shoulder joint. The knee may also be injured, or, indeed, any joint is liaole to be strained, and the best treatment is to apply warm compresses made by wringing flannel out in warm water, placing it over the joint and bandaging in place. An injured joint should invariably be rested, and, in the case of a child, splints may have to be applied. A simple splint consists of a long strip of cardboard, which can be fastened above and below the joint to keep it at rest. So many children have injuries to the knee from falling and bruising or cutting the knee that mothers should always remember this point - to put a long strip of cardboard down the back of the leg from the middle of the thigh to the heel, and bandage it in three or four places. This will keep the part at rest during sleep, and, in addition, will encourage healing. Cuts and wounds should be treated first by stopping the bleeding by firm, pressure with a pad of lint over the part, and this may be fixed in place, if the wound is clean, with a gauze bandage. In the case of a dirty wound, it must be well bathed with water that has been boiled; boracic acid maybe added to this in the strength of a heaped dessertspoonful to a teacupful of water. 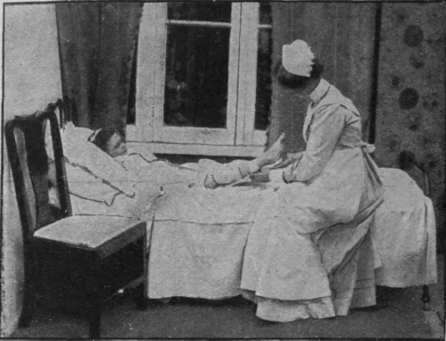 It should be remembered that, when applying pressure to stop the bleeding, the bandage will have to be put on rather tightly, and this may cause stoppage of the circulation, with mortifying of the part, so that the bandage should be loosened in a few hours, when there is no, risk of a return of the haemorrhage. 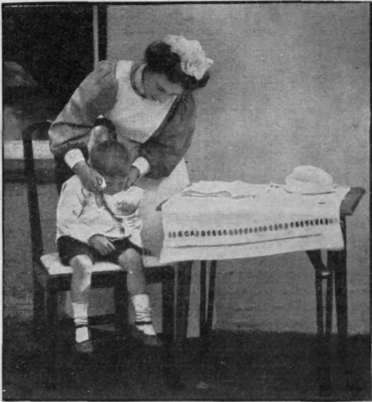 It is often somewhat difficult-to get a child's cut thoroughly clean, and a very excellent measure is to paint the part all round with tincture of iodine, which is very destructive of microbes. If the wound is a slight one, it may also be painted with iodine, which only causes a momentary smarting, and there is nothing better for stopping suppuration. 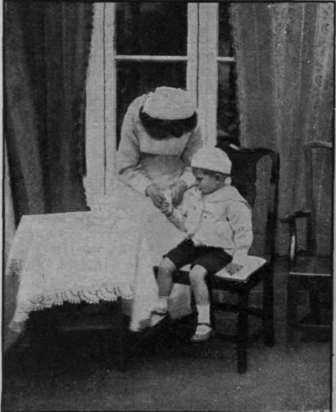 Burns have been considered under "Accidents" in the "Home Nursing" series (page 2779, Vol. 4). To avoid this accident occurring in the nursery, high fire-guards should be the rule. Then lamps ought to be fastened to the wall out of the children's reach," and a kettle should never be placed on a nursery fire if there is not a guard in front. When a child's clothes catch fire, place the child at once on the floor, and cover him immediately with a rug, a curtain, a tablecloth, your own skirt, or anything of a similar nature which may happen to be available at the time. Never wait for help, or waste time running for other people, and never carry a child out of the room until every particle of flame has been extinguished. Very often the best way to stop smouldering, and prevent the clothing sticking to the skin, is to put the child into a warm bath, to which half a teacupfui of boracic powder has been added. Ordinary flannelette clothing should be forbidden in the nursery, as it flares up rapidly if ignited, and is responsible for thousands of deaths every year. There is, however, a special non-inflammable flannelette which may be used with more safety. next: 8. The Way Of The "Comforter"